Stay up-to-date with all of the new and exciting things going on here at Rantoul Foods. We had a quite informative and extensive meeting, together. We had the opportunity to have a live cutting demonstration for our partners and work out some new products and specs. We are so excited to be able to pursue this with y’all! Our partners work hard every day to find the perfect matches for our pork. We got to meet with a young man that is opening his own smokehouse in Plainfield, IL. His focus is on slow smoking and quality, and boy did he come to the right place for quality! Best of luck Chef, and we can’t wait to try it out! Our Industrial Engineer speaks with a new partner in regards to our ABT (Automatic Belly Trimmer). This machine gives us the capability to put each customer’s specifications into the computer to get the exact belly they request, without sacrificing yield. We were so happy to see & host y’all! After visiting them in Florida for a football game, last year, they returned the favor by visiting our facility! They had a strong focus on animal welfare and was here to ensure that our process is up to par! Such a fun and laid back tour! These gentlemen traveled from abroad to see our facility! Afterwards, we enjoyed a BBQ lunch at Blackdog in Champaign! We had one of our more serious tours today. We sat down and discussed new ideas, concerns and potential growth together. Sometimes the best place for these conversations, is face to face. We certainly appreciate you making the travel arrangements! Our partners are always welcome to bring their customers, and that’s just what he did! What better way to market your product, than coming to see where it originated from. Our partner’s customer was able to see the care and precision that is put into every cut. Thank you so much for taking the time to come visit us! There is nothing more that we enjoy, than being able to brag about our humble growth! We hope you enjoyed seeing our improvements as much as we enjoyed showing them. We just cannot get enough of our new cut floor. With each day, we see the improvements and growth as new machinery is installed. Thumbs up to the new automatic belly trimmer! We cannot wait to show y’all the end results. We’re making improvements for our partners. These are the lucky customers that were able to be the first ones to stand on our new machinery on our new cut floor! We had such a blast showing around our customers on their annual trip! We look forward to getting to spend time with you guys, each year. Here, you can see the inside of our new cut floor! One of our favorite things to do on this customer’s annual trip to the states, is to take them to the lake! This year we were able to introduce them to tubing. They really got the hang of it. 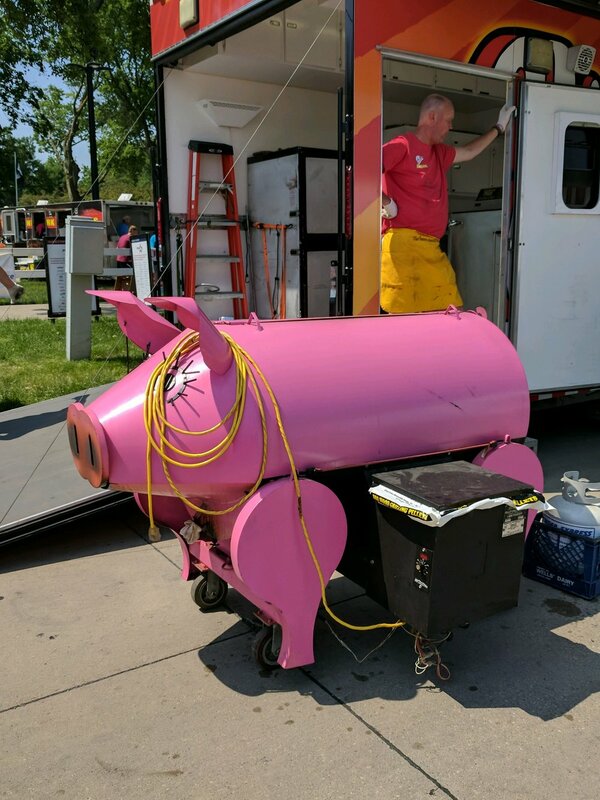 Our customer wanted to get a real look at the whole picture of how their product is made with quality being built into the hog. We are fortunate enough to have a great and open relationship with our hog supplier, Strawn Pork. Thank you for letting us take our customer to your farm to show then what a great team we all make together! Another fun and easy-going tour with some of our international partners and their customers. As always, we appreciate your travels and for taking the time to learn more about your products. 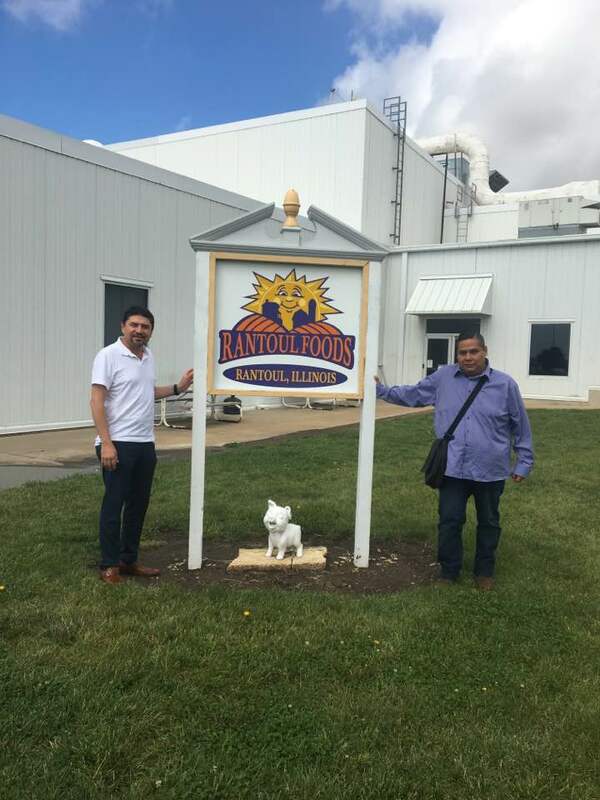 We were so excited to invite our major customer and their partners into Rantoul Foods for a tour!! This opened a wonderful door of opportunity. We can’t wait to see where this takes us together. We were so excited to show our major international partners around our facility. We look forward to this annual tour and updating y’all on all the new and exciting things that we have going on!! See you guys next year. What a fun tour and lunch we got to spend with our partners. We are so grateful for the opportunity to meet face-to-face. This has opened up many new doors and allowed us to brainstorm innovative cuts of pork. We can't wait to see this project through, with y'all. We were more than pleased to show our international partners around our facility. As always, thank you for your travels. We had the pleasure of hosting some of our international customers. After touring the facility, we learned about their country over lunch. So many cool things were shared. Having the opportunity to work with international customers is a blessing. 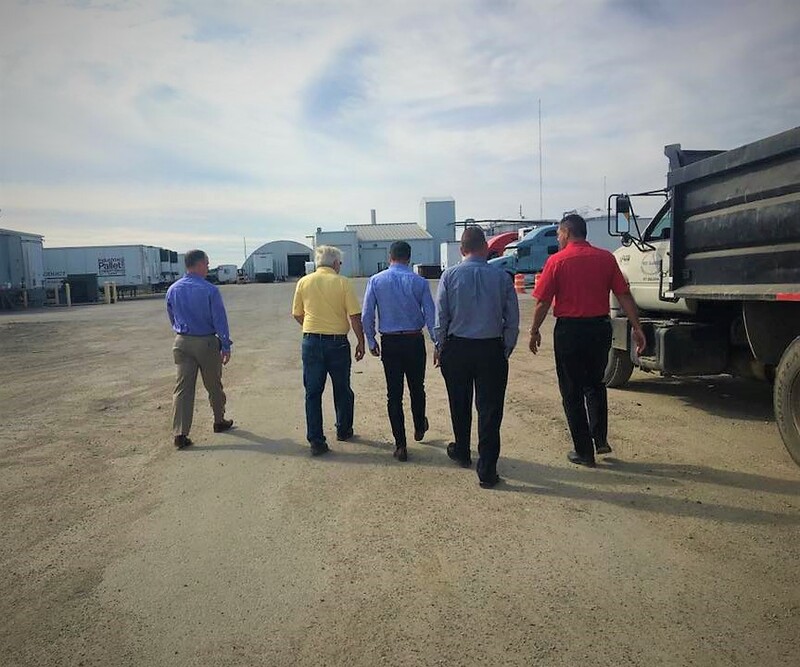 We were so happy to show our customer's customer around our facility today. We got to enjoy a nice lunch and expand our business together. We hope that you enjoy your tour of our sister company tomorrow! We were happy to give some potential customers a tour of our Animal By-Product Conversion System. It is still under construction and is right on track to open October 2017. We look forward to a future partnership with them. Our international customers visited us for a tour of our plant during the day, and joined us for an evening swim that following afternoon. We had the opportunity to have our international customers here for a visit of our operations. Thank you for visiting us. We were fortunate to spend two days with a few of our international partners! Safe travels as you venture back home. Our dear friends from First Midwest Bank traveled out to Rantoul Foods. They toured our facilty and were the first ones to try out our new tourguide sound system. They loved it! The USMEF and a few of our international customers came by the facility today for a tour and lunch. It's always great to meet in person and see what we can do better for our customers overseas. We have recently partnered with Rantoul High School and their FFA Program. We love the idea of encouraging young adults to join the agriculture industry in their path of finding a career. One of the most exciting times for these young adults is the FFA Jacket Ceremony. Many children cannot afford the jackets, as the are expensive. We did not want any child to feel excluded and discourage them from their passion in the agriculture industry. Rantoul Foods purchased a jacket for every student at Rantoul High School that is in FFA!! We are hoping to continue this as a tradition! Another wonderful event in the books! Thank you to the Chicago Midwest Meat Association for all their hard work to make such a great banquet for us all to let loose a little. This year’s theme was “Around the World.” We took this opportunity to turn our booth into, “Pork’s Passport to the Caribbean.” We had so much fun with this theme! Samples and freebies were flowing like crazy!! Each year, we take the opportunity to visit our loyal partners, in their homeland. We are blessed to have them travel to our operations multiple times throughout the year. We couldn’t be more thankful to be able to return the favor. After all of the anticipation, our article is public!! We had such a blast sharing the excitement of our new brand, AGAR, with journalist Lisa Keefe! Haven’t read it yet? Check it out here!! We love helping out our local high school in Rantoul. The Rantoul Eagles Football has a fun get together on Thursday's before their Friday Night Lights, hosted at Coach Delbert's home. We donated some pork to feed the team! Our Golf Outing Sponsors allowed us to raise enough money to support some extra donations! The remaining money that we raised, was donated to our local food pantry in Rantoul, IL! We were so excited to invite Lisa Keefe and her crew into our facility and share a little bit about us! We cannot wait to see how the story turns out!! Thank you Chicago Midwest Meat Association for another wonderful day! This is something that we look forward to attending each year. It’s such a fun opportunity for us to bring our customers and show them a good time, as well as a friendly game of golf! We were so excited to have the opportunity to donate our pork to the “Pork Patio.” After-all, what else are you suppose to crave on a warm fall afternoon, other than a pork chop sandwich! No tummy went unfed. Another wonderful event in the books!! Each year we look forward to meeting with everyone in our industry! Such a wonderful time to see familiar faces and meet new. Check out this neat grill! Clearly everyone was feeling festive this year! Click here to see our feature in the National Provisioner as one of the top 100 Meat Processors! Our President and VP of Sales were honored to be able to attend a talk from the Secretary of Agriculture, Sonny Perdue, and Wall Street Journals’ Mary O’Grady. They were excited to bring back the message and share it with our team. We were so excited to be able to participate in a raffle hosted by a charity called Hospice Hearts. Hospice Hearts is based in Urbana, IL and is an animal rescue serving pets whose owners are no longer able to care for them due to nursing home admission, illness, or death. We donated a whole hog to raise money for them. Kevin & Donna Greene were the lucky winners! We're traveling to The InterContinental Hotel to attend the NAOHP National Conference. We are fortunate enough to have our story told by the intelligent, Dr. David Fletcher, MD. His session is titled "A Case Study in Engineering Healthy Companies: The Rantoul Foods' Success Story." We feel so honored to be a model example for both SafeWorks Illinois Occupational Health Services and BrickStreet Insurance. We had so much fun this week in Boston! We had tons of food samples and neat giveaways for our partner's customers. Thank you so much for the opportunity and we cannot wait to come back next year! Our very own Hog Procurement Manager, Jan, was asked to speak at a breakfast on our behalf. Thank y'all for letting us share our story with you! Christmas is this time of giving. We love giving back to our employees who give us their hard work and time every week. This year we gave our employees hats and sweatshirts! Thank you for another great year! We were so honored to be awarded Reinhart's Supplier of the Year for 2017. It has been a great partnership together, and we look forward to continuing to grow with 'all. We have lots of expansion projects here at Rantoul Foods! We are in the finishing stages of opening a Rendering Plant and the early stages of two new additions! Our Construction Manager took out the drone today to get some awesome aerial footage of all the new construction! Our team had such a blast celebrating the Chicago Midwest Meat Association Annual Meatball! It was such a fun night out to spend with our team. 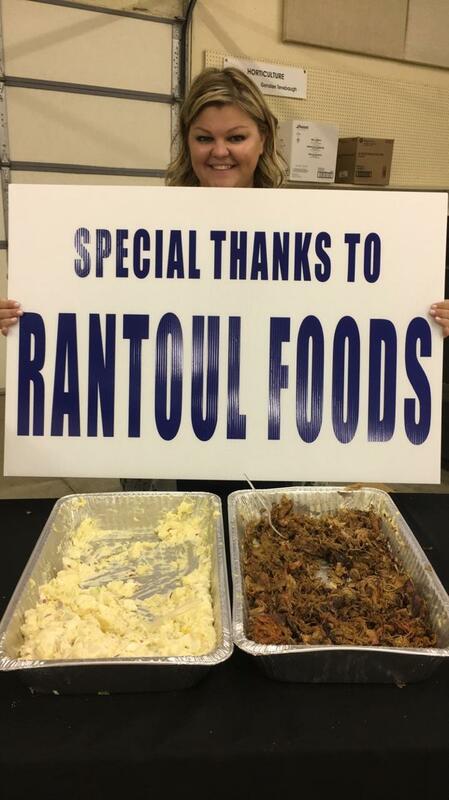 For more pictures, check out our Facebook page @RantoulFoodsLLC! Every year we are thankful to have the opportunity to travel to Japan to speak with some of our biggest international customers. We are excited to announce that we are the cover story for the September edition of The National Provisioner. Don't miss this story!! You can subscribe to recieve your free copy by clicking here. 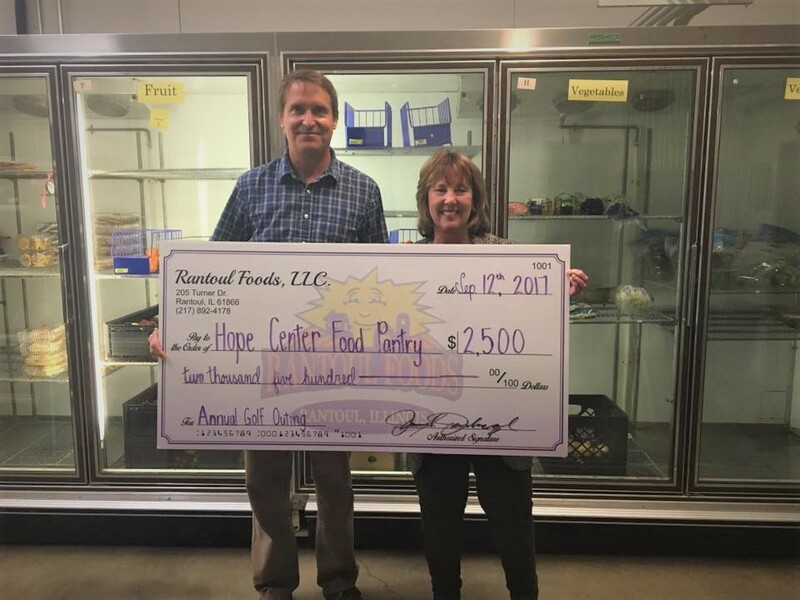 Our Vice President of Finance stopped by Hope Center Food Pantry, on behalf of all of our sponsors at the Golf Outing, to drop off our donation. It's such a wonderful feeling for us to be able to give back to our community. A special thanks to Dena for taking the time to educate us about the food pantry and thank you for helping out the community. Did you know that in the next five years, 2 out of every 3 jobs will require at least a two-year degree? We were happy to attend the Annual CMMA Arthur M. Follenweider Scholarship Golf Outing, again this year. It's always a good time, with great people, and a wonderful cause. The proceeds go to a scholarship fund for the children of Chicago Midwest Meat Association Employees. Thank you Gordon & Steve for your partnership over the years. We are truly going to miss working with you! We were happy to donate to the Champaign Country Fair Livestock Fund! We donated a cooler of our pork products to the Berkshire Foundation for their fundraiser. 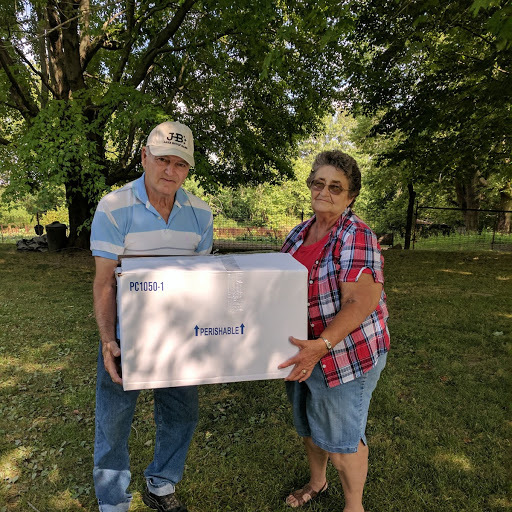 Ken and Julene, from Martinsville, IL are the lucky purchasers! Thanks for your donation to the foundation, guys!! The walls are officially up!! We cannot wait to be running by the end of October! Celebrating 6 years of business. Today marks our 6th year of makin' bacon!! We couldn't be more happy to continue serving our loyal customers pork that's made at the brink of innovation and quality. We are in the process of constructing a Animal By-Product Conversion System. Our company prides ourselves in ensuring that no part of the hog goes to waste. The rendering plant is set to open October 2017. Click the photo to see photos from the event!